The avalanche of zombies leaks continues from the Black Ops 4 Beta and we now have a confirmed list of ALL perks in the zombies mode. Many classic perks are returning in addition to new perks called Bandolier, Deathwish, Perception, Slider, Stronghold, Timeslip and Tortoise. If you're familiar with Treyarch's zombies mode then you'll know only too well that perks are a staple part of the game, dating all the way back to the second zombies map to release. These purchasable perks would provide players with increased abilities like faster reload, explosive damage protection, increased hit protection etc. In Black Ops 4, perks return. Some old and some new ones. Players will no longer hunt for perk machines but rather pre-select which perks they want adding to a map before playing. These features are all part of the new zombies customization options menu. Fans will be pleased to know that several of the perks listed below return from the Treyarch zombies maps of past, including Deadshot, Electric Cherry, Mule Kick, Quick Revive, Stamin-Up and everyone's favourite Widows Wine. 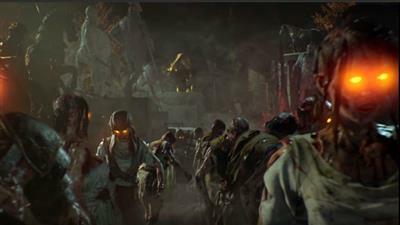 Respectively these returning perks allow the player to access: improved headshot accuracy; an electric defensive shield on reload; the ability to carry three weapons; faster revive for teammates or auto revive in solo; sprinting faster; and a limited but protective barrier from zombie melee attacks. There are also brand new perks in Black Ops 4 for Bandolier, Deathwish, Perception, Slider, Stronghold, Timeslip and Tortoise. There's a strong sense that Slider could well be PHD Flopper in disguise - because of the associated with an explosive on dolphin diving (now sliding). 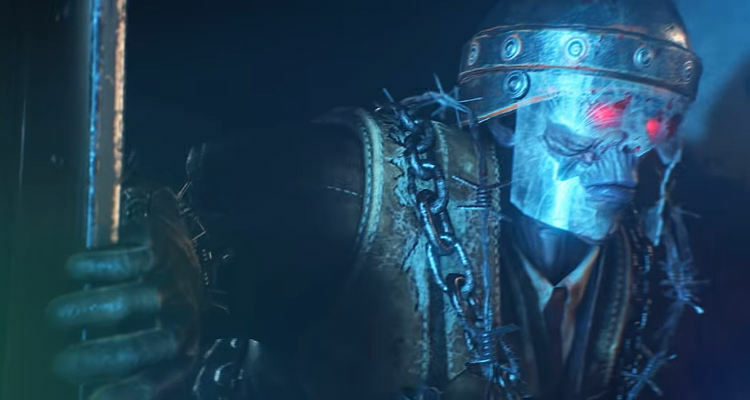 A large question mark hangs over the absence of Juggernog from the list and some would assume that maybe Stronghold is in fact Jug in disguise! 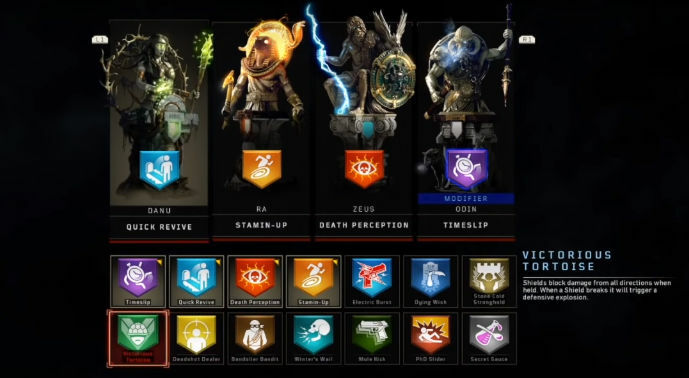 In total there are 13 zombies perks (+1 Random) in Black Ops 4 as shown in the image above and the descriptions below. Timeslip - decreases the cooldown time on equipment, traps, perks, mystery box, PaP and teleporters. Quick Revive - shorter delay between regenerating health and increased regeneration rate. Revive Players faster. Death Perception - the ability to see zombies through walls and also receive an on-screen indicator when a zombie is approaching from another direction. Electric Burst - defensive electric barrier on reload. Stronger when ammo is lower. Dying Wish - instead of going into Last Stand the player goes berserk for 9 seconds. During this phase the player is invulnerable and melee is much stronger. Afterwards player is left with 1 health. Stone Cold Stronghold - standing your ground provides a defensive zone around the player that boosts damage and armour. Victorious Tortoise - if you have the buildable shield equipped then you are protected on all sides. An explosive blast is unleashed when the shield is finally destroyed. Bandolier Bandit - carry more reserve ammo. Widow's Wail - similar to Widows Wine, taking damage activates a defensive explosion which freezes Zombies. Requires two charges before cooldown though. PhD Slider - like PhD Flopper it provides an explosive blast but must be charged by sliding. Secret Sauce - receive a random perk not assigned to another slot. 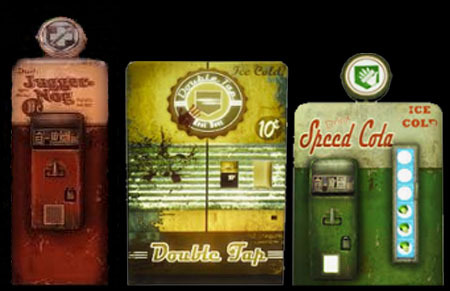 With the launch of Black Ops 4 it's been 100% confirmed that the three original perks of Juggernog, Double Tap and Speed Cola have been removed. Included perks such as the revised Quick Revive and Dying Wish do go some way to replacing the effects of Jug, which when combined with the new "armour" system provide the player with more protection. However, the fast reload effects from Speed Cola have not been replaced and double damage from Double Tap has no direct perk replacement in Black Ops 4. The Pack-a-Punch machine is now the primary source of increasing a weapons power.